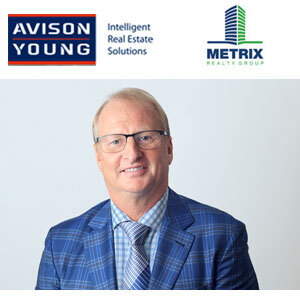 Avison Young’s claim to being the world’s fastest growing commercial real estate services firm was bolstered in the new year with its acquisition of Toronto-based property appraisal company Metrix Realty Group (Ontario) Inc.
“Avison Young and Metrix had some discussions over the past two years and realized in 2015 that an acquisition of Metrix was a good fit,” said Metrix Ontario founder and president Paul Stewart, who will become an Avison Young principal along with Metrix Ontario vice-president Matthew McWatters. “The transaction was a five-month process. The opportunity to be a part of the Avison Young organization and for Metrix staff to go to the next level made the move an obvious choice. The purchase further expands Avison Young’s valuation and advisory service business-line coverage across the Greater Toronto Area (GTA) and the rest of Canada. It also adds 18 employees to Avison Young’s operations. Work is underway to accommodate most of them at Avison Young’s Markham offices. A group primarily focused on institutional real estate will be installed at the company’s downtown Toronto offices, according to Stewart. Metrix Ontario was launched in 2002 and has become a leader in property valuations and consulting, acquisition and disposition due diligence, feasibility and litigation support services in the GTA. It has completed appraisals on office, retail, industrial and multi-family properties, as well as all types of development land. Metrix Ontario’s clients have included a diverse range of public, private and institutional investors, as well as a variety of financial institutions. Stewart expects those clients to follow him to Avison Young, where he’ll lead the GTA valuation and advisory team and help grow the company’s valuation service line across Canada. Metrix Ontario adopted technological innovations and the most up-to-date financial software to present contemporary appraisal documents. While valuation fundamentals haven’t changed over the years, Stewart said the time allotted to complete an assignment has. “While many institutions book annual valuations well in advance, the mortgage industry needs an increasingly rapid response — likely due to the competition in their industry. Avison Young has grown from 11 to 74 offices and from 300 to more than 2,100 real estate professionals in Canada, the United States, Mexico and Europe over the past seven years. It opened new offices in Mexico City on Dec. 2 and in Memphis on Dec. 7. The Toronto-headquartered company provides value-added, client-centric investment sales, leasing, advisory, management, financing and mortgage placement services to owners and occupiers of office, retail, industrial and multi-family properties. Metrix Southwest Inc., based in London, Ont., wasn’t part of the Avison Young transaction. Its management and staff will continue to provide real estate valuation and consulting services in southwestern Ontario.